In a previous post (this one) we described how to create cascading combo boxes in Excel using data validation. You can achieve the same functionality in your Userforms in VBA. The advantage is that you can do the programming and the end user can create the various lists and maintain those lists on their worksheets. That is the combination we are looking for. In this post I will describe one of the many ways this can be accomplished. Here is how this can be done. To keep the example simple we only took the first options from the second lists. This means that if you choose Excel and in the second combo choose Function you will see the options belonging to Functions. If you want to extend this with all the other options from the second list then you create a list with options belonging to “sheets” and name that list “Sheets” and so on for every other option. With all the lists created and all the lists “named” we can created our userform with the combo boxes. So open the VBA Editor (press Alt+F11 or any other way you are used to get to the VBA Editor). Make sure you are using the correct Excelbook by clicking once on the name. Now click on “insert” in the menubar and choose “Userform”. Click on the “combo box” control in the toolbox and click on the userform. Repeat this two times. Your Userform should now look like the userform in the picture below. The next important step is to set the rowsource of the first combobox. Select the first combo box and look at its properties on the left in the property explorer. 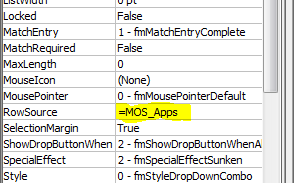 Look for the option “Rowsource” and type the following =MOS_apps. What you actually do here is referring to the named range you created earlier. Let us see if that worked as expected (see picture below). You can easily create cascading combo boxes using lists from the worksheet. Name your lists and make sure you choose the change event of the combo box to set the row source. Now the last question is how to deal with double “naming” options in the worksheet. We will tackle this in the next blogpost about cascading combo boxes. This entry was posted in Excel, Office Tips and Tricks and tagged excel, Excel; Combobox;Depending Lists, Userform on August 1, 2011 by Maurice. Thank you very much. Your instructions are always very simple and easily understandable. Sorry to hear that is doesn’t work for you yet. Instead of asking what does not work i added the sample file to the post. That way you can compare what you have created with the sample file and see where the differences are. Let me know if that worked for you! You are AWESOME Man! I have been searching for this for the past 7 hours….TOO GOOD TO BE TRUE!!! Any Idea on how to create change event code for the comboboxes created on the fly…..I mean I managed to create the comboboxes Named (Request type and Subrequest type) but how to set the rowsource of Subrequest based on the value of Request type.??? Did you download the file attached to the post? Open the VBA and you’ll see how you can change the rowsource from the combobox. You’ll find the attachment at the end of post. Let me know if that works for you.